'Kouzes' and Posner's bestselling The Leadership Challenge has been the most trusted source for becoming a better leader for millions of executives. 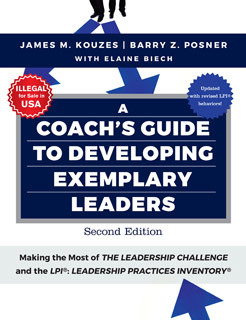 This new guide from Kouzes and Posner, written in conjunction with coaching experts Elaine Biech, provides practical information and tools for integrating The Practices of Exemplary Leadership into a coaching practice or program. Filled with best practices and success stories as well as worksheets and checklists, this comprehensive resource enables coaches to quickly and easily adapt their coaching regimen to include The Leadership Challenge and the Leadership Practices Inventory (LPI).